If you want to ramp up the look of photos in your iPhone contacts list, Ensoul Contacts is here to help you achieve just that. This piece of Mac software is currently on sale for 50% off in our Deals Store, at just $5. Ensoul is an easy-to-use and elegant solution for Mac which quickly fills your iPhone address book with high-quality contact images of all your family and friends. The AutoMatch Face feature assigns Faces from iPhoto or Aperture to your iPhone contacts instantly. Crop, rotate, adjust and enhance contact images in 15+ different ways. 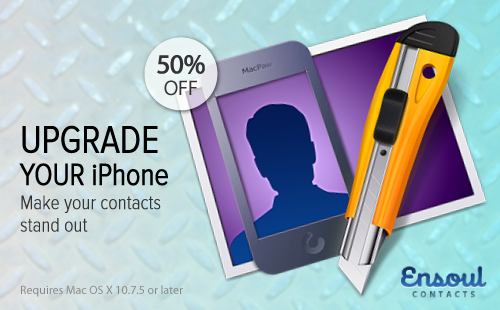 Making your iPhone contacts shine has never been this easy…until now! Ensoul Contacts features automatic FaceMatch, iCloud syncing, in-app photo editing options and multi-library support. OS X 10.7.5 or later is required. The best part is there is a 30 day money back guarantee with Ensoul Contacts so you have nothing to lose if you’re not satisfied. Click here to get Ensoul Contacts for just $5 before the deal ends.